If you thought you were weary at the end of last year you were not alone…. 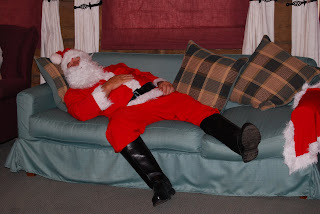 We were beginning to think Father Christmas had forgotten us, but after a long search we discovered him asleep on the couch in the lounge! Fortunately all his gifts were safe and duly distributed to very happy children and relieved parents. 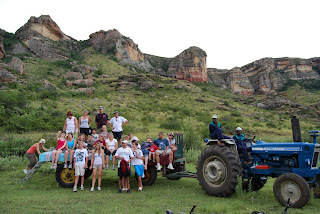 December saw us with wonderful hot weather, if very little rain, perfect for outdoor activities and fun. We did a couple of bicycle, walking, horse riding and tractor outings to Agate Bank and Ibis Gorge and congratulations go to the four year old twins who push cycled all the way there! New Year was brought in on a high note and a few off notes but with a lot of laughs and good cheer. I think that the jury is out on whether Wyndford’s Got Talent, but don’t think any of us will be receiving a call from Simon Cowell anytime soon. Last Saturday saw the river full enough to once again go tubing – actually it was just two brave guests and most of the Wyndford staff! A muddy good time was had by all. We have since then had wonderful rains of 28mm on a number of occasions, and the grass, trees and flowers all breathed a collective sigh of relief. As did the veggie garden, which is now (that most everyone has departed) produced the most wonderful gems, cucumbers, baby marrows, yellow tomatoes, pumpkins, carrots, beetroot and two very ‘watched’ watermelons are on the way. Talking about things on the way – Celvin and Angelique’s twinkle in their eye is now three months on as a twinkle in the tum! Not just the bunnies and ducks busy around here…. For those of you here at New year, George is making good progress after the clot in his leg (didn’t really think those magnificent legs could actually get bigger than they are) and we are just grateful he is still here. It was a great lesson in patience for him to be immobilized while we had a full house and hats off to all our staff who proved that the Wyndford Team works well. We also have spotted a new resident at the junction of the driveway with the road to the car port…a small ground squirrel has made the gutter his home, much to the fascination of our husky, Dodge! Wyndford rates will not be inflated over the World Cup, the only difference is that the Senior Discount does not apply over this period but the 20% discount for a four night stay or longer still applies – bookings are rolling in so don’t leave it too late if you do not want to be disappointed.